MOHAMED KAMEL ALI AMR, Minister of Foreign Affairs of Egypt, said he stood before the Assembly representing his country in a new era and with a novel face. Seeking to implant the seeds of a brighter future deep in the arid lands of reality, the Egyptian people came out in masses on 25 January to call for democratic reforms and a strengthened respect for human right rights, fundamental freedoms and social justice. They were backed by the Egyptian armed forces, who exemplified patriotism and unity with the people, consistent with their core doctrine as guardians of the nation. Moving forward, Egypt was determined to complete the transition phase. Since the revolution, it was witnessing new internal dynamics and a wide national debate that involved all segments of society and covered all issues on the national agenda, starting with the drafting of a new constitution and the organization of legislative and presidential elections. That process would culminate with power being handed to an elected civilian authority. 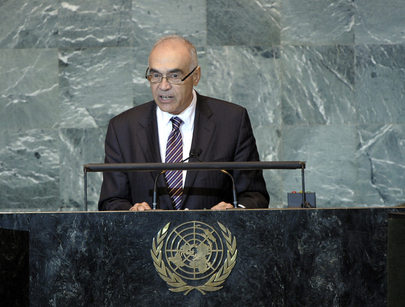 Speaking also on behalf of the Non-Aligned Movement, he recalled that in July 2009 Egypt had assumed the chairmanship of the Movement, which had held its first summit 50 years ago, and had undertaken numerous activities to strengthen its capacity to respond effectively to new and continuous global changes. It also sought to reinforce the Joint Coordinating Committee of the Group of 77 developing countries and China. Among other things, it aimed to reinstall development as the top priority of the United Nations, while also advancing initiatives on food security, women’s empowerment and defeating human trafficking. The Movement believed there was a pressing need for the Organization’s comprehensive and substantial reform, including altering the membership of the Security Council, revitalizing the General Assembly and strengthening the Economic and Social Council. Financing for development commitments must also be honoured, while global economic relations should become more balanced, including through the establishment of a more just trade system. Turning to the question of Palestine, which remained unanswered after two full decades of fruitless negotiations, he said the world had witnessed another failure yesterday by the Quartet to come up with a balanced vision to achieve the goal that everyone knew and of which they all approved. It had become “totally absurd” to continue talking about a peace process while Israel continued to construct settlements on Palestinian territory in the West Bank, to alter the features of occupied East Jerusalem, to use violence against civilians and its blockade of Gaza. For its part, Egypt was, and would remain, committed to the goal of achieving a just and comprehensive peace. It would also continue its efforts to end Israeli occupation of the Occupied Palestinian Territory and to reach a solution on all final status issues in a specific, agreed upon and internationally guaranteed time frame. Reiterating Egypt’s continuing support to Sudan and South Sudan, he also paid tribute to Tunisia’s revolution and congratulated the National Transitional Council for now occupying Libya’s United Nations seat. Egypt was ready to provide any support it could to Libya’s reconstruction efforts. In addition, it backed all efforts to achieve stability and to meet the expectations of the people of Yemen and believed that a lack of change in that country’s status quo would have grave implications on the region’s security and stability. Noting the serious developments unfolding in Syria, he reiterated Egypt’s position that the only solution to that crisis would be found in ending the violence and engaging in serious dialogue among all parties in a climate of political openness. He added that Egypt would always strive to achieve stability in the Arab Gulf region. Addressing other matters, he expressed concern that a facilitator had not been nominated, or a host country selected, for the Middle East conference endorsed by the 2010 Review Conference on the NPT. He reiterated Egypt’s position that the right to peaceful uses of nuclear energy must be linked to full compliance with international commitments under the NPT, adding that that entailed the full cooperation of all States, including Iran, with the International Atomic Energy Agency (IAEA). Egypt expected the United Nations to maintain the support of the various components of the African peace and security structure and to continue to back the continent’s development efforts. It once again invited external parties to refrain from negatively interfering in Somalia’s internal affairs and to instead contribute to ongoing efforts to improve the humanitarian situation and achieve stability in that country. Also exercising his right of reply, the representative of Egypt, responding to the statement by Canada’s Minister, said the latter’s comments on Egypt were “utterly false”. He advised Canada to follow closely the 25 January events in Egypt and the social solidarity such events had fostered worldwide. Muslims and Copts had stood together side by side. Since that date, no Copt had ever been harassed. He was not surprised by such false allegations from Canada, which considered itself a custodian of human rights worldwide without carefully studying the facts and the circumstances surrounding them.